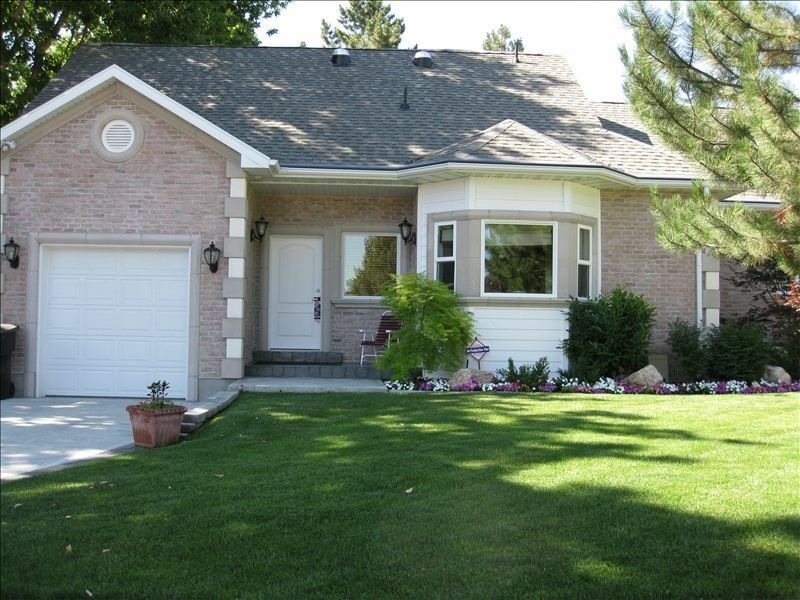 1 Bdrm Quiet Neighborhood in Holladay area of Salt Lake City. Call for specials. Apartment, 1bdrm w/ 1 qn bed, 1 bathroom, living room has a twin sofa sleeper. 1 bedroom apartment in upscale, quiet Holladay neighborhood. It is an easy 5 minute walk to the busline to take you to the ski resorts, U of U or downtown, although we recommend a car to fully enjoy the area. Fully furnished, full kitchen with everything needed. Washer-dryer, very comfy queen sized bed with quality linens, full bathroom and an attached single car garage. Apartment has a private entrance and it's own driveway around the corner from our home. Apartment is attached to the home, and was built as a mother-in-law apartment. We live on the other side of this house, so when both parties are in both kitchens you will hear noise. There is also a home theater on our side that you may hear muffled noise, although we never watch movies after 10PM. We have a very old, slightly senile Jack Russell Terrier that will bark whenever our doorbell rings. So, if you really hate dogs or are highly allergic this might not be a good fit for you. Keywords: 1 bedroom with one queenbed, full kitchen, close to bus-line for skiiers, Univ. of Utah, or downtown. Fully furnished for a stress-free stay, 2 flat-screen TVs, large walk-in closet. Lots of excellent restaurants nearby. Please do not rent this property if you have extreme CAT ALLERGIES! We have a cat. We built this lovely apartment for out of town guests, perhaps a parent needing care, or perhaps for our own private nurse should we need it someday. This is a 'mother-in-law' apartment that is physically connected to our house. It is separated by 2 solid core doors and a stairwell, so it is very private, but if both parties are in both kitchens you will hear some muffled noise. The lot is a corner lot, where our home faces west and the apartment faces North. This apartment has it's own large driveway and private entrance. Single car garage, private entrance, large driveway that belongs to only the apartment. (our home has a separate driveway around the corner) Apartment has it's own washer and dryer. The entrance is separate and private from our home. House is on a large corner lot, where our house faces West and the apartment faces North. Tub-shower combination, one sink, plenty of counter space. Extra towels. Hot water heated floors, perfect for the winter! We are about 15 minutes from downtown in normal traffic. No view from the actual apartment, but from outside---the mountain view is beautiful! Heat is hot water heat in the floors, so tile in kitchen is warm. There is no dust or blowing air in the winter. Air conditioning is a regular vent system---not a swamp cooler. Plenty of extra sheets and towels. Washer and dryer located in garage---see photo. Plenty of parking on large driveway. Narrow, but deep single car garage attached to house. Apartment can be entered from garage or from the front door. Washer and dryer are located in the attached garage---which kitchen door opens to. See photo of garage. Also, vacuum cleaner, broom and cleaning supplies are available for those staying longer. Full-size fridge with freezer on top. Has ice maker. Past tenants have left common spices, salt & pepper etc. All dishes and cooking supplies available. Full-size electric stove/oven with four burners. Microwave, toaster, blender, coffeemaker, waffle iron, all pots and pans, cooking utensils, etc. Dishes and cutlery. Drop leaf table that seats up to four. There is a 32' flat screen TV in the living room and a 23' flat screen in the bedroom. I have loaned several tenants toys when needed. Small shaded front porch with one chair. Cottonwood Communty Rec Center with a gym and pool is nearby. Five minute walk to bus-line to take you downtown or to the ski resorts. Ski resorts are about 20-25 minutes drive time from here---little longer if riding the bus. He said it was roomy and very comfortable. Great place; all the amenities you need--including garage. Very clean and neat--almost made me want to tiptoe so not to mess things up. Great place. We went to ski. This home was very convenient to the ski areas. Having a garage was a big plus since it snowed a lot while we were there. The owners were nice enough to keep our sidewalk and driveway cleared on snow. The home had everything we needed! Good location. Very clean. Comfortable bed. Great little apartment in a great location: close to shopping, eating and the canyons resorts. A little longer (40 minutes to 1.5 hours) to Deer Valley, depending on weather. Try Cafe Madrid at the corner of Spring and Highland. Canyons bus park and ride is a short drive from the apartment. Address above is actually our address to our house. The address of the apartment would be 1856 E. Spring Lane, but because no address actually exists in city records you can't put that in GPS and have it work. So, put our address on Cottonwood Club Dr. in your GPS, but then you will have to back up and go around the corner and park on the driveway with the single car garage. OR, you can put 1858 E. Spring Lane into GPS---but DON'T GO THERE! That is my next door neighbors house! The apartment looks just like the photo, and you will recognize it when you get there. Text or call Jennifer at 801 831-0247 with any questions. ONE or TWO NIGHT BOOKINGS ARE ONLY ACCEPTED LAST MINUTE---A WEEK BEFORE IN SKI SEASON, 2 WEEKS REST OF THE YEAR. OR---if by looking at the calendar, there are just a few nights bookended by longer stays, a one or 2 night stay will be OK. We have a strict cancellation policy during the ski season. There will be no refund except for 75% of the nights we are able to re-rent. You will be refunded 75% of the nightly rate, but only if we are able to re-sell those nights.